Royal Train Rides - Rentals is actually an off spring of Royal Train Rides, well known as the #1 manufacturer of trackless trains in the world. Since Royal Train Rides has spent years helping companies set up their own trackless train rentals world wide, it only seemed logical to make sure that this fantastic ride is available for rentals in our local area. For more information on our products, just give us a call or email. My Grand father Samuel M. Vendola got started in the carnival business in 1948. Being born in the mid sixty’s, amusements were always a part of my life. I grew up working in that side of the business during the 1970’s and 1980’s. I began operating amusement kiddie rides at the age of 10 and then the adult rides at age 12. From age 13, I was involved in every aspect from erecting and disassembly, to winter quarters refurbishing of amusement equipment. By age 17, my duties also included transportation, and power generation for the equipment. It was in 1989 when I stumbled in to the rental side of the business. I personally owned a small Zamperla kiddie train ride that was on a track. I was working a carnival with that train, when a man came up to ask me if I would rent him the train for his child’s 1st birthday. I then turned to him and said, sure I will. It was at that party that I had received such a great response, that I had taken on three more rental bookings. In 1990, I started my own business of renting amusement rides, inflatable’s, fun food equipment and games. It grew very quickly as the renting of amusements became more popular during the early 1990s. It was in 1991 when I found the Royal Express trackless train. I purchased the ride, and the Royal Express was an overnight smash hit every where I went with it. Four years later, we added another Royal Express, and a newly introduced Royal Ranger trackless fire truck it too was an instant hit. 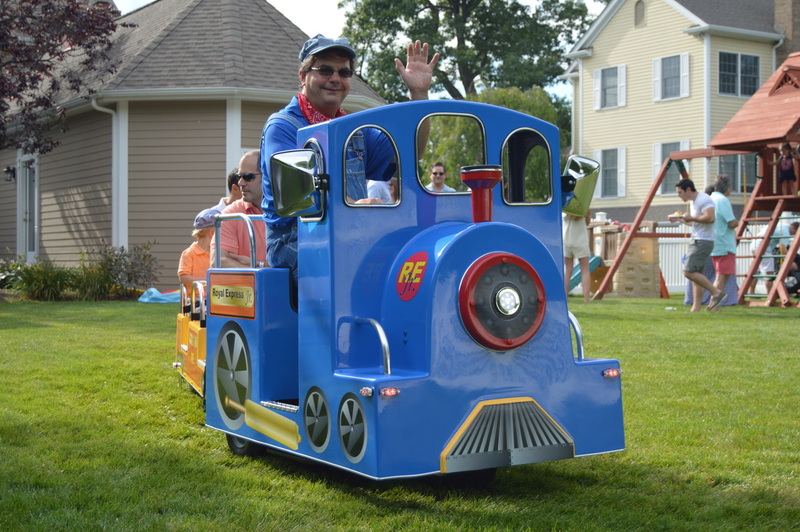 Over the last 23 years, I have done many different events with the trackless train. Some of my experiences include company picnics, school fairs, township fun days, firefighter’s fairs, television commercials, celebrity parties, parades, and much more. The trackless train is such a popular amusement ride. It is a very versatile machine and is a proven crowd pleaser everywhere it is presented. The P.A. Music System and L.E.D. Lighting package make the Royal Express stand out even more during nighttime events. Trains are forever timeless machines and children are drawn to them automatically. Children and adults alike are instantly attracted to the Royal Express and the best part, mom and dad can ride too! These are the reasons why I enjoy the business. We specialize in the rental of trackless trains. We have a complete working knowledge of what works best in presenting the train any special event. We know how to operate them in a safe and professional manner as well as providing the very best train ride experience. Our long history of operating the Royal Express will be sure to show through at any event larger or small. All equipment is always clean and delivered to your event on time. Our well-trained staff will always be polite and attentive to you and your guests. Each one of our Royal Express Trackless Trains are all battery powered. This provides the best riding enjoyment for you and your guests, and what’s even better, they are Green Machines. No loud noise or exhaust fumes here! They also work equally as well indoors as they do outdoors.